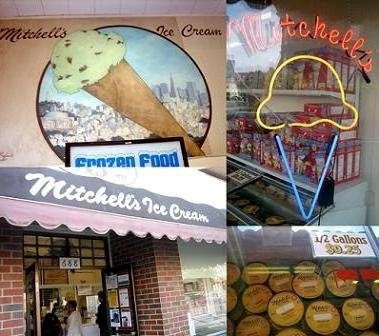 Being up in SF, I had to try Mitchell's. It's sold locally in a lot of stores and very popular. We went early to get the ice cream this time. There weren't as many people around. They offer free parking right behind the store, which was very convenient. They seem to be an Asian company based on the flavors given and their tropical nature. This place by far had the most choices. 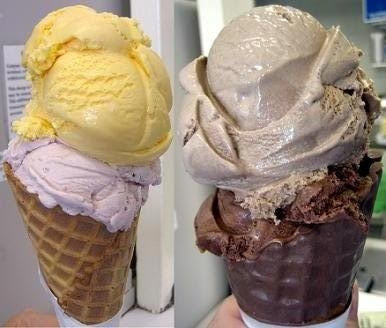 Since it was not too busy, we were able to try out a few flavors before choosing which one. Be sure to grab a number by the door as you enter. Ms. Lin chose the Halo Halo and Langka, which was Jackfruit. The Halo Halo was Baby Coconut, Jackfruit, Purple Yam, Pineapple, Mango, and Sweet Beans. I found it extremely interesting to see Jackfruit as a flavor choice, it was definitely something unique. I didn't really like the Halo Halo mainly because I hate beans. Ms. Lin liked her choices and they were very different from what we have tried at the other places. I didn't gamble as much and just stuck with the safe choices. They were the Kahlua Mocha Cream and Peanut Butter Indulgence. It was good, but nothing special. The ice cream here was much creamier than your normal ice cream.